The universe is full of mysterious exploding phenomena that go boom in the dark. One particular type of ephemeral event, called a Fast-Evolving Luminous Transient (FELT), has bewildered astronomers for a decade because of its very brief duration. Now, NASA’s Kepler Space Telescope — designed to go hunting for planets across our galaxy — has also been used to catch FELTs in the act and determine their nature. They appear to be a new kind of supernova that gets a brief turbo boost in brightness from its surroundings. Kepler's ability to precisely sample sudden changes in starlight has allowed astronomers to quickly arrive at this model for explaining FELTs, and rule out alternative explanations. 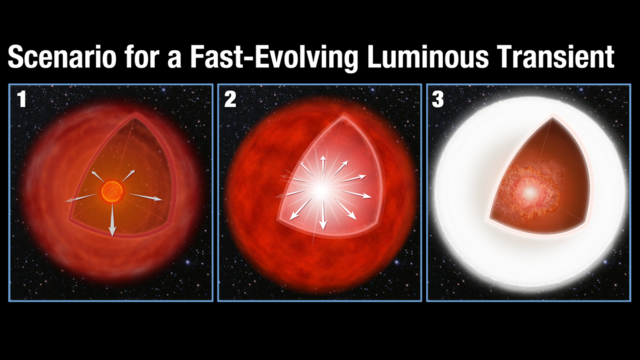 Researchers conclude that the source of the flash is from a star after it collapses to explode as a supernova. The big difference is that the star is cocooned inside one or more shells of gas and dust. When the tsunami of explosive energy from the blast slams into the shell, most of the kinetic energy is immediately converted to light. The burst of radiation lasts for only a few days — one-tenth the duration of a typical supernova explosion.